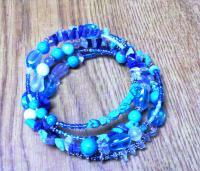 Learning how to make beaded jewelry can be a creative and fun way to express yourself. There are countless ways that beads can be combined to produce unique pieces, or replicas of pieces you may admire. Try a few of these simple projects to get the hang of bead placement and design, then let your imagination take over to create interesting new styles. Beads are perfect for making dangling or intricate earring patterns. These three-pronged, two color earrings are simple and fun to make, and once you have the basics down you can play around with length, color and pattern to create your own designs. Thread a green bead onto a pin head wire so the bead sits against the flat disc at the bottom. Place a white bead on top of the green, and place two more green beads on top to finish. Make a second string of beads identical to the first. Reverse the pattern on the third wire; begin with a white bead, then layer green and the remaining white. Hold one string of beads in your non-dominant hand and grasp hold of the top of the wire with the pliers in your other hand. Pull hard on the wire; this will settle the beads against the disc on the bottom of the pin wire. 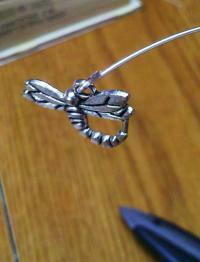 Use the pliers to begin bending the top of the pin head wire into a small loop. When the loop is half-closed, insert the jump ring, and continue to bend the top of the wire around it so it slides on the ring. Repeat with the other two wires. Locate the loop at the bottom of the earring wire. 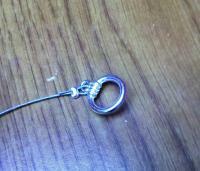 Insert the tip of the jewelry pliers through this loop and gently pull it open. Insert the top of the jump ring into the half-open loop, then squeeze the loop shut again with the pliers. Repeat to make the second earring. 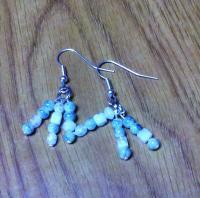 Using beads of similar size and shape will create a uniform look for these earrings. 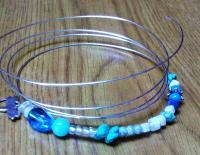 For something a little different, you can use a slightly larger bead on the end of each wire for contrast. Beads can be easily strung one on top of another to create a solid necklace of beads, but they can also be spaced apart so they appear to float around the wearer's neck. Crimp beads are used to hold the solid beads in place at specific spots along the cord. The end result is a necklace that uses negative space as a part of the design. Measure out the flexible wire to the desired length. It should hit the intended wearer at mid-chest. Cut the wire with the scissors to size. Thread a crimp bead onto the wire, stopping approximately 5-inches from the end. 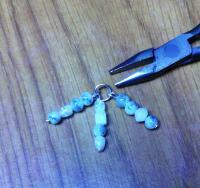 Squeeze the bead inside the crimping pliers until it flattens and holds fast to the wire. 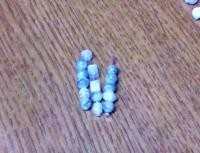 Slide a blue bead, two white beads and a second blue bead onto the wire. Follow it with a crimp bead and squeeze it into place so the four beads are trapped between two crimps. Slide a crimp bead onto the wire and stop it approximately 2-inches from the last crimp. Squeeze it into place and add the blue and white beads. Finish with another crimp bead. Slide another crimp onto the cord and stop it 1/2-inch from the last. Add the beads and crimp to finish. Start the next group of crimps and beads 2-inches from the last. This should give you five groups, evenly balanced on the cord. Slide a crimp bead onto the end of the wire but do not squeeze it. Slide the end of the wire through the loop on the toggle. Double the end of the loop back on itself and slide the end of it through the crimp. Squeeze the crimp on the double strand of wire, holding the toggle in place. Memory coil bracelets are a lot of fun. They can be chunky or filled with seed beads and can incorporate lots of color, texture and materials. 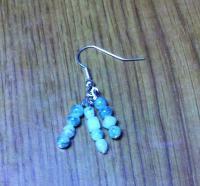 They can be as big or as small as you want them to be and you can really have fun with the bead and color placement. Measure out the length of wire you want. Coil the wire up so you can see how many times it will turn around your wrist. The more coils, the more beads will be needed. Grasp the end of the wire in the pliers and bend It back on itself to form a small loop. If you wish, insert a small charm onto the loop at this time. Begin sliding beads onto the bracelet from the free end. Push them along the coils until they reach the loop at the end. Pay attention to the way the colors balance on the bracelet; try to avoid long strings of color that stack on top of one another as the bracelet turns. Keep pushing beads onto the coils until they are filled. Leave approximately 1/16-inch of wire at the end. Grasp the loose wire at the end, and fold it over on itself to form a loop to finish. If desired, add a second charm. You don't need to attach the ends of this bracelet together, as the memory coil wire will retain its shape around your wrist. Just make sure that both ends are looped tightly so they won't come undone. Adding the charms will help ensure that the beads remain on the bracelet, while also adding visual appeal. There is no wrong way to go about creating beaded jewelry; the color choices and ultimate placement and pattern of the beads is yours. There are some tips, however, that can help make the process smoother. Wire gauges get thinner, the higher the number. Try to use between 18 and 22 gauge for most projects; anything thinner can snap under pressure. Keep in mind that the thinner the wire the easier it is to wrap and bend, while heavier gauges tend to hold their shape more. Invest in good wire cutters and jewelry pliers. 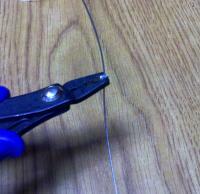 Wire can dull your scissors quickly, and larger pliers can damage the wire if you don't take care. Vary your bead size with your wire size. 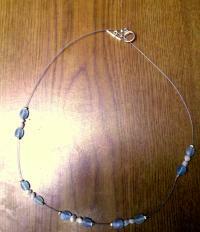 Some seed beads are too small to be used on heavier gauges of wire; adjust accordingly. Study the jewelry you already have and practice recreating various pieces to learn more about placement and patterns. Being able to create your own beaded jewelry rather than depending on what's in the shops can be very liberating. Not only will you save money, but you can create your own signature style. Begin creating your own jewelry today and see what creativity arises.